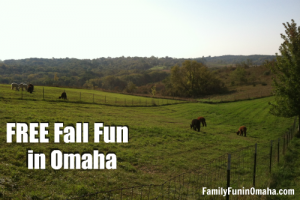 Fall is filled with so many fun things to do. 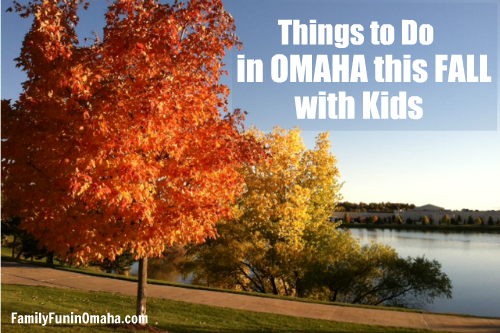 Enjoy many family-friendly events this Fall in Omaha! 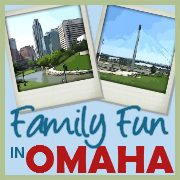 We do our best to share current information in Family Fun in Omaha, but event details may change. It is always a good idea to verify the information before visiting. 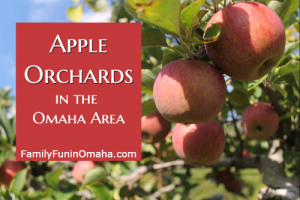 Visit one of 10 Apple Orchards in the Omaha Area for Apple Picking and more Fall Fun! 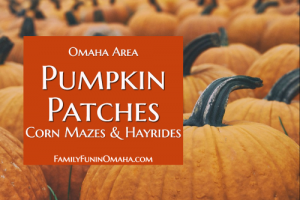 Visit one of the Omaha Area Pumpkin Patches to find the perfect pumpkin, get lost in a Corn Maze, go on a hayride, or sit by a bonfire. Bring the whole family to a fun night of 90’s music and swimming. Location: Mockingbird Hills Community Center, 10242 Mockingbird Dr. Enjoy special events on the first Friday of every month. Location: Union Pacific Museum, 200 Pearl St, Council Bluffs. Watch Hot Air Balloons participate in competition flights and evening glows, in the beautiful surroundings of Ditmar’s Orchard. Parking: $10 per car (includes admission; All Proceeds with go to American Cancer Society/Relay for Life. Events are subject to weather: Check their Facebook page or call for updates. Location: Ditmars Orchard, 19475 225th Street, Council Bluffs. Canoe rides, rock wall climbing, live music, face painting, nature hikes, live animals. In addition, there will be arts and crafts, educational materials and discussions regarding water conservation, quality and recreation. Lunch will be provided on a first come, first serve basis. Location: Papio-Missouri NRD / Chalco Hills, 8901 S. 154th St., Omaha. Camp Fontanelle Pumpkin Patch/Corn Maze offers something for everyone: Zipline, Tree Climbing, Maze, Barn, Campfires, & more. Special Events include Movie Nights, Search for Treats, and Scary Maze. Location: 9677 County Road 3, Fontanelle, NE. Visitors can participate in public monarch tagging at the Zoo on September 8th and 15th, and at Wildlife Safari Park on September 16th and 23rd. Events at both locations will be from 1 to 3 p.m.
Activities at Omaha’s Henry Doorly Zoo and Aquarium will be free for Zoo members or included with paid admission. Activities at Wildlife Safari Park will be free for Wildlife Safari Park members or included with paid admission. Visit Vala’s Pumpkin Patch & Apple Orchard this Fall with over exciting 50 attractions and shows. The Chalk Art Festival is a weekend-long live art celebration. Local/regional artists and professional madonnaris will transform patches of Midtown Crossing pavement into pastel chalk masterpieces. Location: Midtown Crossing at Turner Park, 3110 Farnam St, Omaha. The Fort Omaha Intertribal Powwow honors the traditional dance, music, artistry, oral history and foods of various tribes across Nebraska and the surrounding region. Location: Metropolitan Community College Fort Omaha Campus, 5300 N. 30th St.
Gifford Farm Fall Festival – September 15-16, 2018 (10 a.m. – 4 p.m.), $5 each ages 2 & up. Hayrides, animal visits, scavenger hunt, pony rides, old-time vendors, raffles, and more. $5 each ages 2 & up. Location: ESU#3 – Gifford Farm Education Center, 700 Camp Gifford Rd, Bellevue. The community is invited to enjoy a free concert and the largest fireworks display ever staged in Turner Park – celebrating the Navy’s newest combat ship, the USS Omaha. A carnival will be held at 6 p.m. prior to the showing of “Back to the Future” at 7:30 p.m. Bring blankets and come on the field at Werner Park to watch this classic movie. Concession stands will be open. The annual movie night is in support of Children’s Hospital and Medical Center. Help support the hospital and the amazing, life-saving work they do for children in our community. Donations will be accepted at the gate. While the event is free, guests are encouraged to RSVP here. Location: Werner Park, 12356 Ballpark Way, Papillion, NE. On Saturday, September 22th, museums across the country will adopt the policy of the Smithsonian, opening their doors for free to visitors with a Museum Day ticket. Each Museum Day ticket provides free admission to the ticket holder and one guest. Food and fun provided and you bring the tent. Activities include outdoor cooking, games, camp fires & other fun activities. Register online, or at any community center by September 16th. $7 per person or $28 per family. Spend the day exploring the Arbor Day Farm Tree Adventure, or combine it with the AppleJack Festival in Nebraska City, September 21 – 23, 2018. Roam the pastures with 35 alpacas. Feed an alpaca (food is provided). See the baby crias. Browse the wide variety of alpaca products for sale. Come for a fun evening of activities and an outdoor viewing of the Disney/Pixar Movie COCO. Activities will include face painting and coloring paper guitars. The inside activity begins at 6 p.m. and the movie will start at 7:00 p.m. 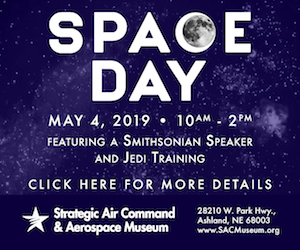 Participants are encouraged to bring a lawn chair or blanket to sit on. Location: Mockingbird Hills Community Center Front Lawn, 10242 Mockingbirg Drive, Omaha. Free hayrack rides, bounce house for the kids, pumpkin painting, live music, pumpkin pie eating contest, craft vendors, specialty products from your favorite local farmers and more. 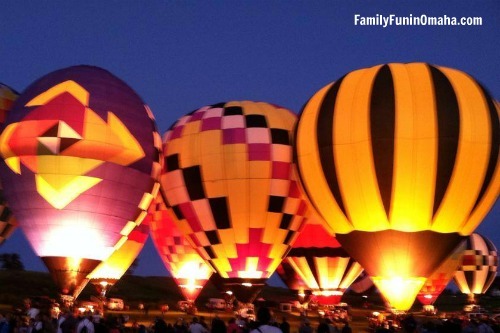 Take a ride to their pumpkin patch, make fall craft, explore the trails, play games, and more. Small pumpkins are $2 each. 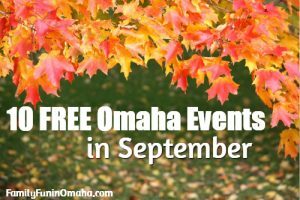 RSVP online at parks.cityofomaha.org under “Activity Registration” button. Location: Hummel Park Nature Center, 3033 Hummel Park Rd. Omaha. A popular event with many kites! Bring your own kite and kids can bring a bag for the candy drop. La Vista Soccer Complex, just south of 66th & Harrison Streets, La Vista. Visit the Lied Jungle to see free-flying bats or stop by Kingdoms of the Night to see nocturnal animals during their daylight cycle. Spooktacular event tickets do not include general Zoo admission since this event occurs after regular Zoo operating hours. Each fall, Keep Omaha Beautiful conducts a large-scale cleanup event in which local youth groups pick up litter and recyclable items from public sites all around the city of Omaha. Participants receive fun incentives and a letter of commendation from the Mayor. This year’s Youth Fall Cleanup will be Friday, October 19th through Sunday the 21st. Groups can do their cleanup at any time during this weekend, and at any public location throughout Omaha (neighborhoods, schoolyards, parks, trails, and dam sites). Register to join thousands of Omaha youth in cleaning up our city. Deadline to register is Friday, October 12th. If individual volunteers or small groups would like to join a bigger event, you can register to join the Keep Omaha Beautiful + Baxter Subaru cleanup event on Sunday, October 21st at Seymour Smith Park from 12 to 2 p.m. A free lunch will be provided. Register at tinyurl.com/YouthFallCleanup. Wear your costumes and bring the entire family out and celebrate all there is to love about autumn. Guided hikes, games, scavenger hunts, refreshments, campground trick or treating & hayrack rides. Pre-registration is required for this event by October 17th as space is limited. Online registration will open September 11th. Attendees must purchase a $3 per vehicle daily entrance pass. Location: Hitchcock Nature Center, 27792 Ski Hill Loop, Honey Creek, IA. Come in costume and trick-or-treat with historical characters throughout the museum, crafts, games, and more. Included with regular admission. 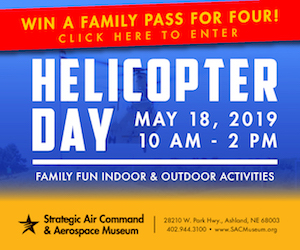 The event will feature various modes of transportation with sports cars, hotrods and muscle cars, aircraft and interactive model train displays throughout the Museum. To add to the event excitement, the museum will hold a Super Hero Trick-or-Treat on October 27, 2018 (10 a.m. – 2 p.m.). Come in costume and trick-or-treat around various autos on display. Have a wonderful fun-filled Fall!